The most powerful diesel engine in the world. 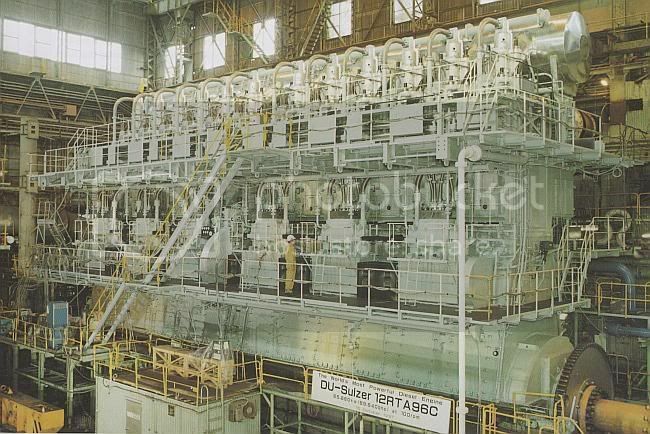 The Wartsila-Sulzer RTA96-C turbocharged two-stroke diesel engine is the most powerful and most efficient prime-mover in the world today. 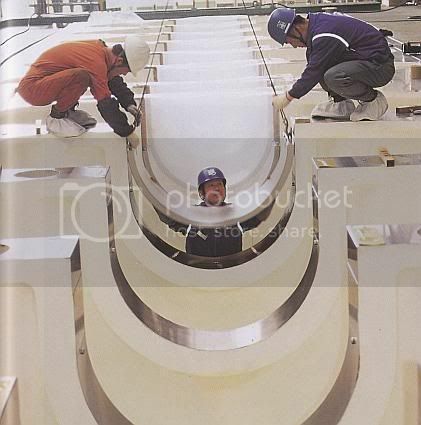 The Aioi Works of Japan’s Diesel United, Ltd built the first engines and is where some of these pictures were taken. It is available in 6 through 14 cylinder versions, all are inline engines. 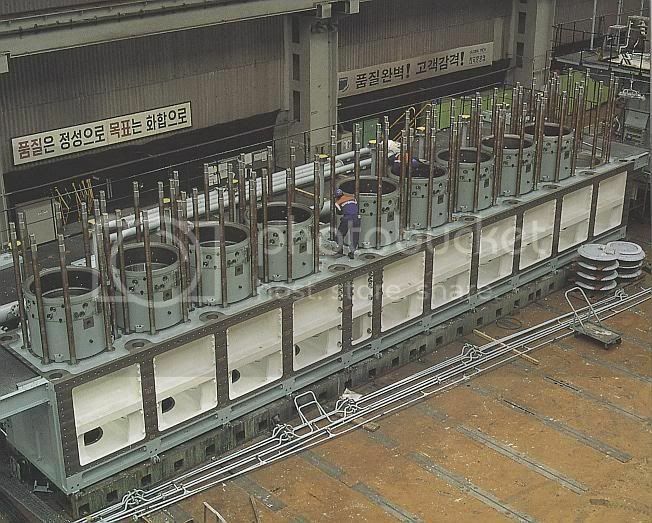 These engines were designed primarily for very large container ships. Ship owners like a single engine/single propeller design and the new generation of larger container ships needed a bigger engine to propel them. The top of the connecting rod is not attached directly to the piston. The top of the connecting rod attaches to a “crosshead” which rides in guide channels. 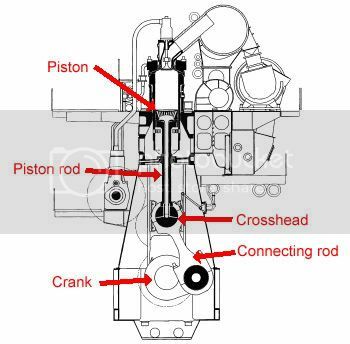 A long piston rod then connects the crosshead to the piston. The “spikes” on the piston rods are hollow tubes that go into the holes you can see on the bottom of the pistons (left picture) and inject oil into the inside of the piston which keeps the top of the piston from overheating. Some high-performance auto engines have a similar feature where an oil squirter nozzle squirts oil onto the bottom of the piston. Worked on both Shulzer and and MAN B&W as a Marine Engineer. MAN B&W makes equally powerfull engines, and are tend to be better in design, from a maintenance point of view. I supply Wartsila as well as Man B&W seals for these. I’ve never seen what they do, I only hear of it. I’m impressed! Never seen anything this utterly massive in terms of mechanics. How about building time for this? You’ve actually worked on these? I bet these pictures don’t do it justice in terms of size. 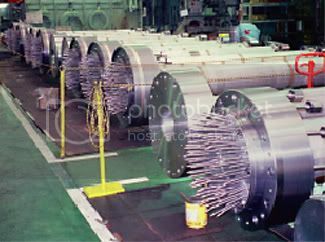 I supply Wartsila as well as Man B&W seals for these. Iâ€™ve never seen what they do, I only hear of it. Iâ€™m impressed! The seals must be massive! That is a great question, unfortunately I have no idea how long it would take to build one of these. Can you believe that Wartsila is from Finland. Same country that Nokia came from. Also try to see next time you ride an escalator or elevator look for the brand KONE also a huge Finnish company. I just love this country that is also the least corrupted country. You should visit. Its like a Barel each stroke F- that.. no wonder the Planet wants to exterminate us..
Wow! 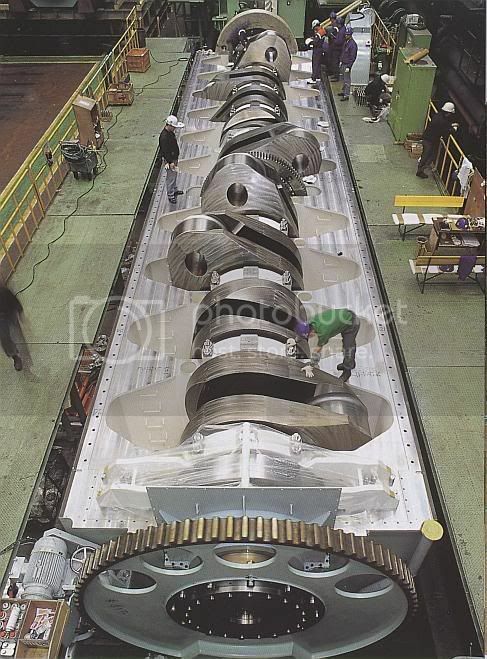 The cylinder deck I thought gave the best example of just how massive this engine is. I want to see the turbochargers! And final compression ratios. I bet theyre not measured in millimeters! What do we replace these with at the end of the “Cheap Oil Era”? I can’t imagine brewing bio-diesel at the rate they drink oil! Will coal and steam come back? Wind was once used, but much lower tonnages and longer times were involved. When these monsters are gone will manufacturing come back to the U.S.A.? Does the end of cheap oil have a golden lining in this respect? The Russians have nuclear powered icebreakers and the U.S. has nuclear powered aircraft carriers, will containerized shipping go nuclear? God help the oceans if nuclear ships go down! We are in for exciting times in the near future aren’t we! Exactly why I’m glad to be living in this year/time. lol. god help us. 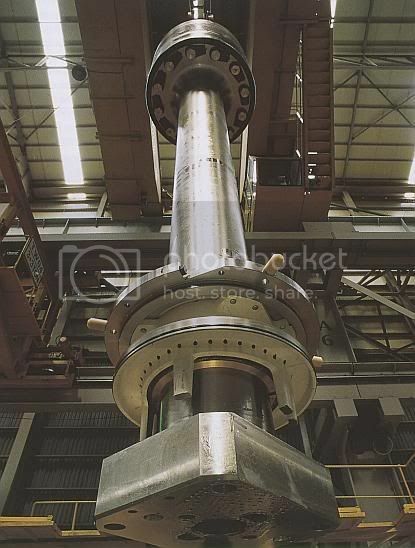 I think it would be fascinating to see the machines used to make the crankshaft, pistons and connecting rods. Previous Previous post: It is confirmed, fish do fart….that is where all of those bubbles come from! Next Next post: Back in 2003 hilton.com was hacked. Here is a photo.